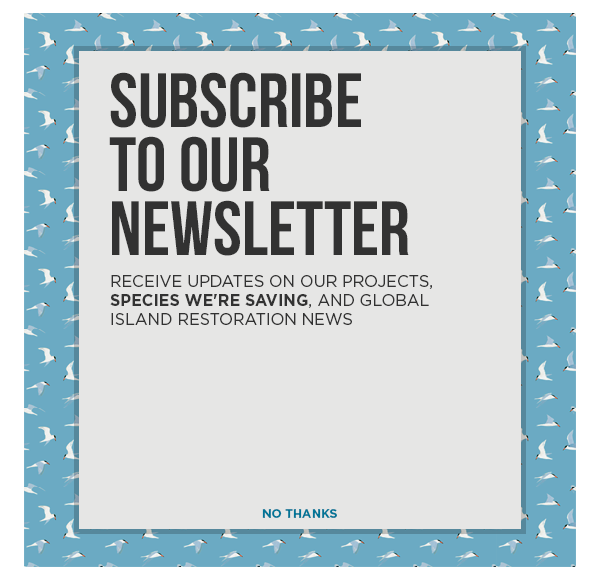 WHYY The Pulse features Island Conservation’s Director of Science, Dr. Nick Holmes, in a story about unintended consequences as he explains the introduction and removal of invasive species on Macquarie Island. Maiken Scott (Host): When humans discover a new place they sometimes end up changing what was there in dramatic ways. That happened on Macquarie Island. It’s a tiny, remote spec of land between New Zealand and Antarctica. It belongs to Tasmania which is part of Australia. Nick Holmes: And it’s affectionately known as Macca or the Great Green Sponge. It is as green a green as you can imagine. Nick Holmes: It would have been an incredibly noisy, smelly, rich green environment that would just be wall to wall with penguins, and elephant seals, and fur seals. It would have been like in a busy London underground subway. There would have been just bodies constantly moving, shoulder-to-shoulder and a deafening noise of whistling and calling. And then as you move up into the slopes you will start to get a really special kind of seabird. And there would have been more than a dozen species of these burrowing petrel. And the burrowing petrels and prions and they are flying around and making all these amazing calls. And so that is what you get amongst this rich green carpet of Macquarie Island is these dense smells of the ocean and these bizarre sounds like you are in some kind of rave discotech. Maiken Scott: So here is this island with its beautiful landscape and all this animal life and then in come seafarer and they bring new creatures to this island. What did they bring and what happens next? Nick Holmes: When these people come to the islands they bring animals with them, accidentally and on purpose. The animals that they bring on purpose will include things like cats and there were rabbits. Then there are accidental introductions and in this case, it was rats. These cats were brought probably to help keep rats down on the ship but also for company at night. But these cats weren’t kept indoors and they were let go on the island and they soon discovered these millions of seabirds that were up in the slope. And the rabbits very quickly, the rabbits were brought to the island as food as a sort of insurance strategy for those people on the islands because it was a familiar food to them. Maiken Scott: So at first which creatures did best on the island – the rats, the cats, the rabbits? How did they impact what was there and how did they fight each other? Nick Holmes: The sequence of the animals that were brought to the island. We know that cats were documented very early with some of the first human arrivals. And these cats would have made very fast work of animals native to the island. We know from estimates in the early 1980s that cats were predating so hunting and killing and eating more than 60 thousand seabirds a year. And very quickly more than 10 seabird species went into decline and were extirpated from the island. We also know that rats consume seabirds. Rats will eat invertebrates. They are remarkably efficient and will consume variety of things on the island and that can have devastating consequences to the system itself. It starts to be disrupted. Rabbits would have consumed the vegetation and these islands the vegetation on the islands like the seabirds evolved in the absence of these kinds of herbivores and these kinds of predators and so there is no natural defense. Maiken Scott: By the 1950s scientists became worries that the island would be forever changed if no one stepped in. They tried different things with varying results but in the 1990s the governments of New Zealand and Tasmania ended up waging an all-out war against the cats on the island and they eradicated them. Nick Holmes: And almost immediately they started to see some of that change. There were some species like the Cape Petrel and the Grey Petrel which very quickly turned up on the main island in places that people knew well and knew that in recent history there was no evidence of them being there. And so the removal of this predator had an immediate effect. And in 2011, just 10 short years after the removal of cats, the resources, the technology, and the political will all came together to remove and completely eradicate rabbits, rats, and mice from the island. They completed that job successfully and now there are no more cats, there are not more rats, rabbits, or mice on the island. And so those unintended consequences of those sealers arriving on the island from so long ago. They had all come to a halt. Maiken Scott: What are some of the lessons that your scientific community has learned from all that has happened on this island? Nick Holmes: We can’t turn back the time and go back tell these sealers that introducing the cats was a terrible idea that will lead to all these devastating consequences but some of the lessons we learned are to have hope and to be brave. That there are opportunities to help some of these native species return back to their original locations and to support what once was. And what happened on Macquarie Island to be able to successfully eradicate cats, rats, rabbits, and mice is also being successfully replicated on islands around the world. There have been more than 1200 different attempts to do similar things with invasive mammals on islands around the world and the success rate is about 85%. So the lesson from Macquarie Island is to have hope and be brave that we can make a difference. Will it go exactly as we predict? Maybe not, but let’s put the best of what we have together and see if we can’t help make the world a better place. Listen to the story at WHYY The Pulse. Advance to minute 35 to hear Dr. Nick Holmes tells the story of Macquarie Island.